March 5, 2013 By This post may contain affiliate links. 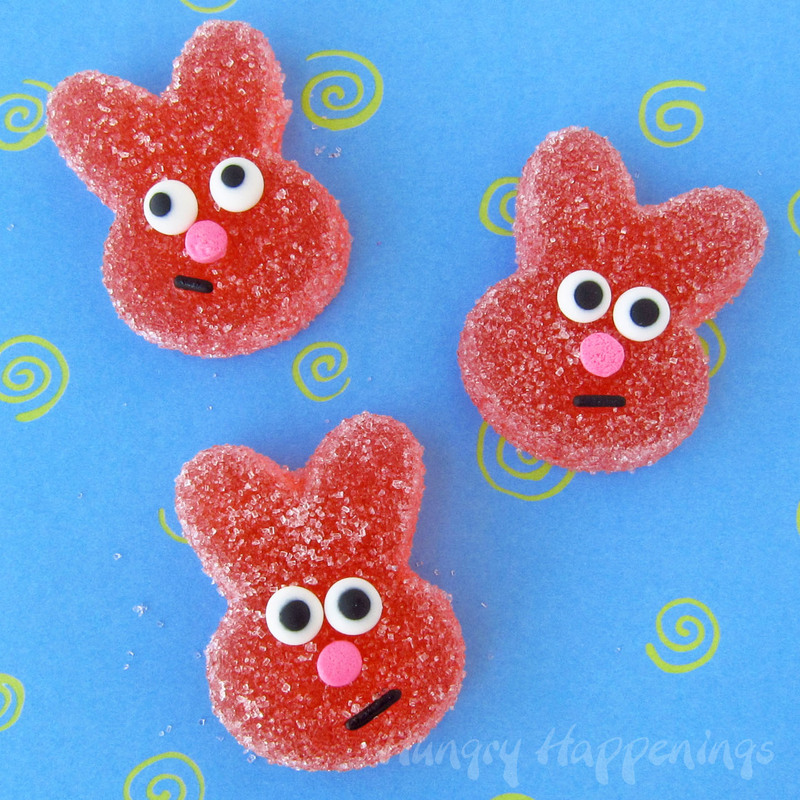 If you love Sour Patch Kids you are going to absolutely love these Homemade Sour Gummy Bunnies! 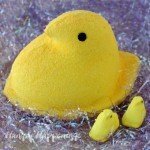 They are a great Easter Basket treat and they don’t have all the chemicals in store bought candies! Sour candies aren’t at the top of my list of must have items in my own Easter Basket (yes, I still get an Easter basket,) but they are on my husband’s list. He loves all things sour: pickles, vinegar, capers, lemons and limes, and of course sour gummy candies. The more it makes him pucker, the better. His favorite Easter candy is Sour Bunnies, so this year, I thought I’d make him a homemade version of his beloved tart treat. Being he enjoys snacking on my homemade gumdrops, I thought I’d start with that recipe and transform the candies from sweet to sour. What makes a candy sour? Citric Acid. It is packaged in powdered form and has been extracted from fruits and vegetables including oranges, lemons, limes, tomatoes, and grapefruits. The powder can be mixed with sugar and used to coat the outside of a gumdrop. The more you add, the more potent the pucker power. Food grade citric acid is available on-line, and in candy/cake decorating, health food and grocery stores. 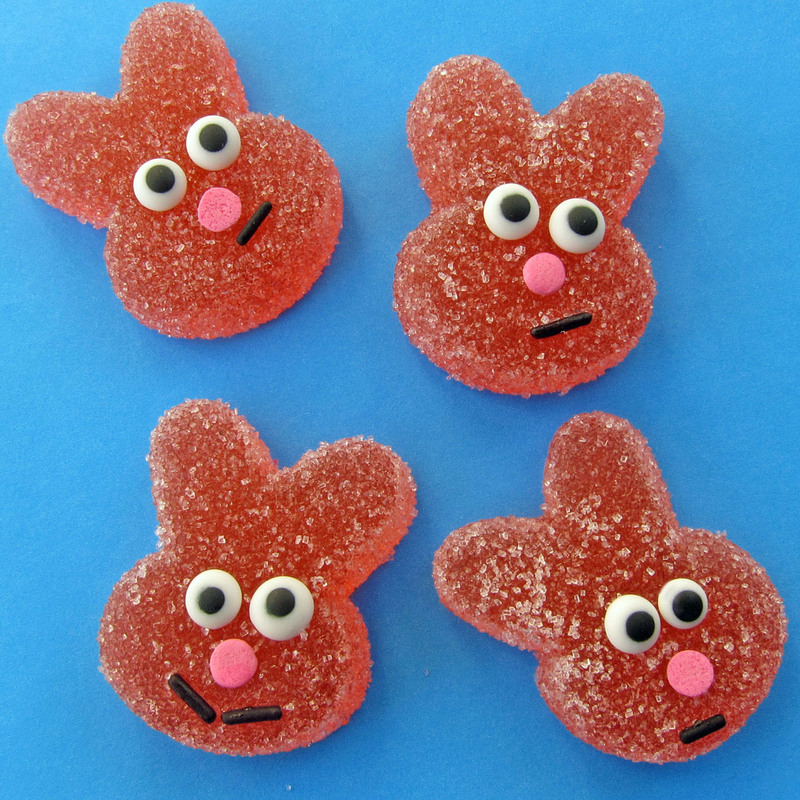 As is customary around here, I added faces to the plain gumdrop bunnies, as I felt they lacked character. I can’t help myself. Everything is just cuter with a smile. Just a note before you begin: I used a gas stove and All Clad pans which conduct heat really well. It took my sugar much less time to boil to temperature than called for in the original recipe. So, be sure to watch your thermometer, instead of using time as your guide. Butter the sides of a 1-1/2 or 2 quart saucepan. Set aside. In the buttered saucepan pour corn syrup into the bottom. Sprinkle sugar in the center of the pan. Turn heat on medium-high and allow it to cook for one minute. Then stir gently to dissolve sugar. Be careful not to splash the sugar crystals onto the side of your saucepan. Bring to a boil, stirring constantly. This took me just a few minutes, but it can take up to 10 minutes. Clip your candy thermometer onto the side of your pot. Cook, without stirring, until the thermometer registers 260 degrees Fahrenheit. You will continue to cook your sugar (ultimately you’ll want it to reach 280 degrees which is the soft crack stage,) but at this point, you need to set your pan of pectin mixture back on the stove and heat it over high heat until it comes to a boil. Once your pot of boiling corn syrup/sugar reaches 280 degrees remove it from the heat or turn off your gas. Slowly and VERY CAREFULLY drizzle in the hot pectin, stirring slowly yet constantly. You DO NOT want to splash any of this hot boiling sugar on your hands. Once all the pectin has been poured into the saucepan, return it to medium-high heat and cook it for one more minute, then remove from heat and pour into a glass bowl, with a spout, preferably. This stops it from continuing to cook. Immediately add food coloring, if using, and flavoring. Start by adding 1-2 drops of color and 1/4 teaspoon of flavoring. Add more coloring, if desired. To check if you like the flavor of your gumdrops, fill a glass with ice water, take a small spoonful of your hot gumdrop mixture and set the spoon in the ice water. Leave it in the water at least 30 seconds. Remove it and touch it to make sure it is cool. Return to water, if too hot. Taste it. Adjust your flavoring accordingly. I found 1/4 teaspoon of the apple oil to be the perfect amount. NOTE: If using this bunny mold or any other soft flexible silicone mold just follow the steps below. 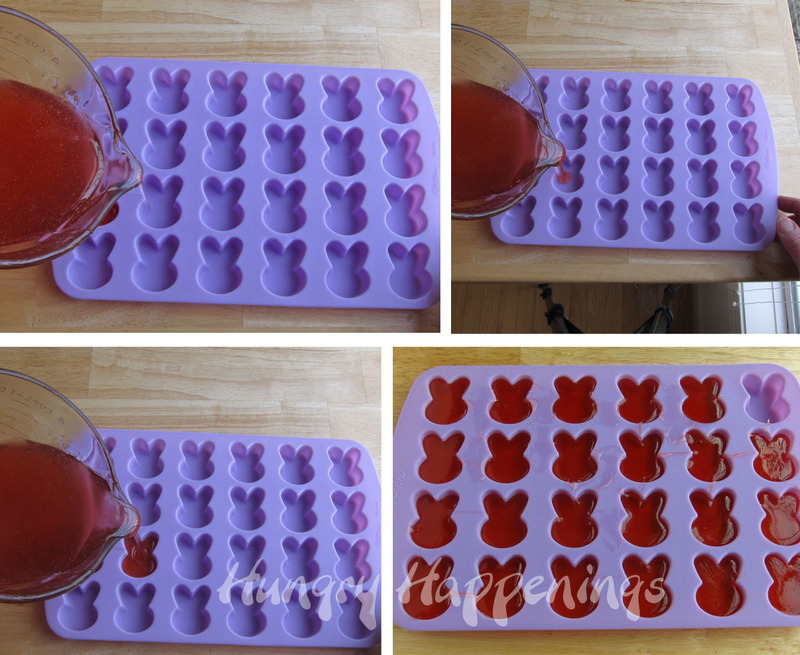 If you are using a stiff silicone ice cube tray, I would suggest brushing a very light coating of vegetable oil into the mold.Carefully pour the hot mixture into the silicone bunny mold, filling each cavity about 2/3rd’s full. Allow the candy to cool at room temperature for up to 8 hours. If you are in a hurry, like I was, cool for an hour then freeze for an hour. To remove the gumdrops from the silicone mold, press on the backside while peeling the candy out of the mold. 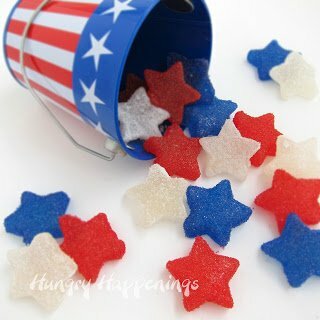 Pour colored sanding sugar into a dish or bowl. Stir in 1-3 teaspoons of citric acid. Taste the sugar as you add the citric acid, and add more to your liking. I used 1 1/2 teaspoons for one batch of bunnies and 2 1/2 teaspoons for another. I preferred the less sour, but my husband loved the intense sour flavor of the other. 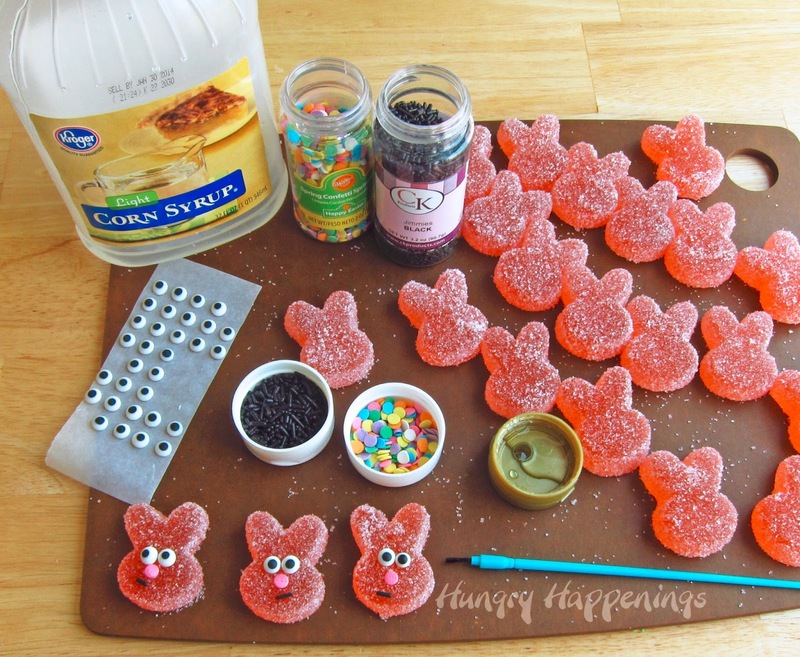 Drop your gummy bunnies into the sugar and toss to coat. Allow your Sour Gumdrop Bunnies to sit at room temperature for at least an hour before packaging. You can decorate them now, if you’d like. Use corn syrup as glue and add candy eyes, pink confetti nose, and black or chocolate jimmies for mouths. 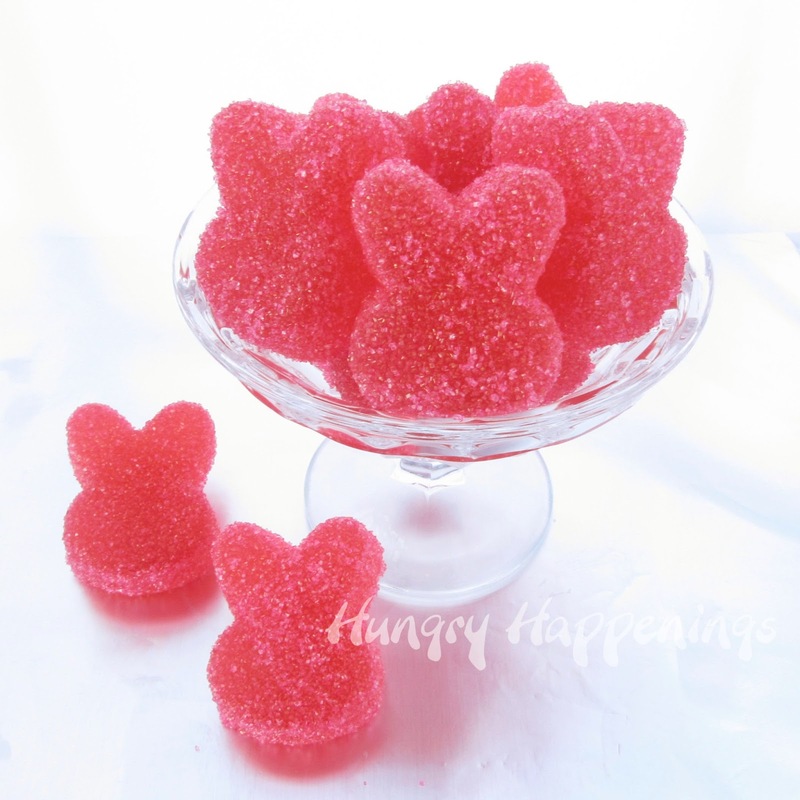 Your Homemade Sour Gumdrop Bunnies will keep for several weeks if stored in an airtight container. there you go again! thanks for the super original, super sweet idea. aidyn and i will be heading back to the kitchen for this one for sure! My husband is a gummy monster. I am amazed at how much gummy candy he consumes. These are adorable. Will try this recipe for sure. Thanks!. It's funny you say that, when we were at Disneyland at Christmas, I thought, what an amazing job the Disney Imagineers have, and I would have loved to have been one of them. Thanks for sharing these!!! Do you grease the molds before filling them? You mentioned in the Gumdrop Post that you used oil to grease the molds and wanted to try butter the next time. You did not mention anything about greasing the molds for the Gummy Bunnies. Please let me know-I want to make these tomorrow. I have a huge collection of silicone ice cube trays in various shapes that I'm dying to use!! FYI Ikea always has some really cute ones. Hi Karen, I'm so glad you asked that question. I meant to mention it, but forgot. The bunny mold are very flexible and soft so I did not have to grease them at all and they came out so easily. The star shaped ice cube trays were much more stiff so I did use the oil. I tried making the stars once without oiling the mold and had a hard time removing them. I was able to get them out with some help, but had to pull them quite intensely. Happily they looked fine once removed. So, bottom line. Check your mold. If it feels really flexible, skip the oil. If it's stiff, use the oil. I think they taste better without the oil. I love sour, thank you! I was wondering if citric acid is the same as the powdered True Lemon (unsweetened). Also, is Knox gelatin the same as the Sure gel? I happen to have them on hand but not sure if they are adequate substitutes. Any help is appreciated! Hi Marne, I have never tried powdered True Lemon and don't know what it tastes like, but if you like the flavor of it, mix it with some sugar and see if it tastes like the outside of a sour candy. Knox gelatin is not the same as Sure gel. 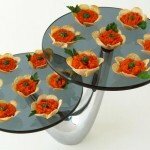 You can find other gummy or gumdrop recipe on-line that us the gelatin instead of the sure gel. Just make that recipe and coat it in the sour sugar. I've always wanted to make gum jellies, known in France as "Pâte de fruits", but so far I havent't. Now looking at your pictures I can see perfection about your work of art. Congrats, Beth. You deserve all the compliments! Oh, I love Pâte de fruits. I leaned to make them from Swiss chef, Ewald Notter. We used fresh fruit purees and they were heavenly. I need to dig that recipe out and make them again soon. You just saved me so much time trying to remember where I saw the recipe for sour gummies!!! 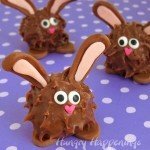 I wanted to make some for Easter and I should have known you were the one with the recipe! THANKS – I LOVE sour gummies! I will need to make more of these soon, as there are only a handful of bunnies left in our candy jar. 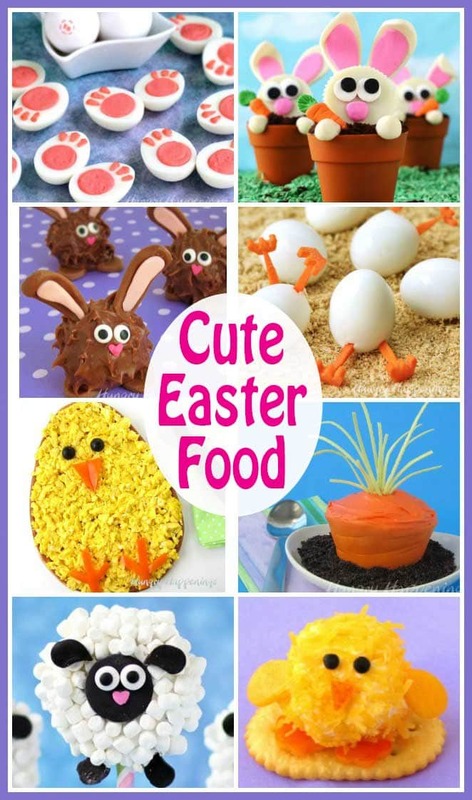 I just love how cute these are and how versatile the recipe is. I'll be keeping my eyes peeled for molds at garagle sales now. How fun! Pinning! 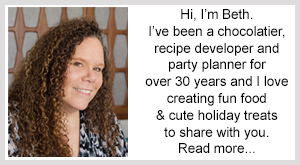 I absolutely love your website! I saw the sour gummy bunny recipe and couldn't wait to try it! My kids love gummies, and my husband loves sour candy! It was a perfect idea. 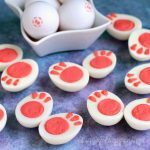 However, once I made the gummies ( i followed the directions very carefully) my gummies weren't solid….when I took them out of the mold, they were very sticky and soft…some didn't even hold their shape. I let them sit a while longer, and they are still soft. (i made them yesterday) Can you give me any suggestions, or ideas of why mine didn't turn out? 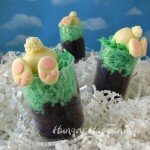 I wanted to make them for easter, but did this trial run first. Any help you can give me would be great. I'm glad you gave the sour bunny recipe a try. If your gummies didn't solidify, it was because they didn't get cooked to a high enough temperature. It is possible that your thermometer isn't calibrated just right. It could be off by several degrees which can really impact candy making. You can check your thermometer by bringing a pot of water to a rolling boil. Clip the thermometer to the side of the pan and check the temperature. It should read 212 degrees. If it's off, then you will have to adjust up or down according to it's reading. I'm going to guess your thermometer is off by about 4-5 degrees. You could just cook your next batch of gummy mixture to about 285 and it should fix the problem. As a test, before you pour the hot mixture into your mold, fill a glass with ice water, pour in a spoonful of the mixture and allow it to cool for a minute. Remove it from the glass. It should feel like a gumdrop at this point. If it is too soft, heat it longer, then try again. This way you wont ruin a whole batch. I love this! Have you ever had the citric acid/sugar mix melt on the candies? Mine keep doing that…after I coat them it's like the sugar begins to liquefy and eventually runs off the candy altogether. Any ideas?? Hi Jessica, I have not had any trouble and don't know what would cause the citric acid/sugar to liquefy. Sorry. Could the problem Jessica I was having with the sugar "melting" have anything to do with humidity? These look fantastic! I am going to make some for our Christmas treat selection! That is a possibility. If the candy is wet and sticky from humidity the sugar could slip off. I'm so happy to hear they turned out great for you. 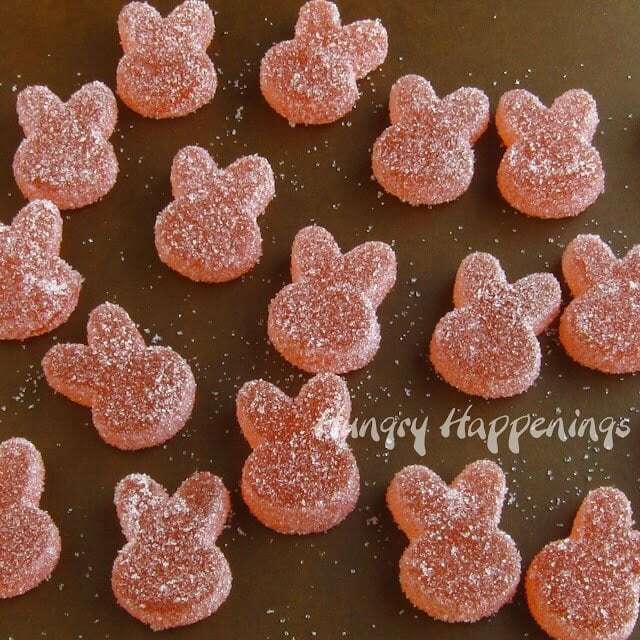 I really love homemade gumdrops and may need to make some more before Easter. I had that happen once, when I got a phone call, and didn't work quickly enough. The candy will begin to set fairly quickly, so you have to work reasonably fast. If it does being to set before you get all the molds filled, you can heat it back up just until it is liquid again. If you heat it too much you will end up with hard gumdrops, so just heat it so it can easily be poured into the mold. You may end up with candy stuck to the sides of the pan and you can scrape that off onto a silicone mat and just eat it once it's cooled. Disreguard my messages! I was mixing the pectin in at 260 then boiling to 280! Doh!! They came out great!!! How long would you say they keep for? Glad you figured it out. I've kept them for well over a month and they were still really fresh. My pectin came in 1.1 oz packages with a separate package of calcium. I added 1.75 oz of pectin to 3/4 c water and it immediately became a huge glob of goo. Where did I go wrong? Hmm, I don’t know why that happened. I’ve made this recipe many times and have never had that trouble. It should have melted once heated even if it got that thick. Did that work? So during my third pregnancy right now I have a crazy craving for sour punch straws–I thought surely if I make these from scratch they will be not as bad for me, ha! Would this recipe be good for that? I’m wondering if I could find the molds to make them in a similar shape that they come in? 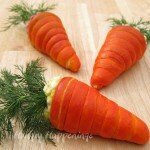 This recipe looks like it would be perfect for them! I always think there is a benefit to making treats at home from scratch, but I’m not a nutritional expert of any kind, and I can’t say how these would differ from the sour punch straws except for the flavor. I love these sour gummy candies. They are soft and easy to chew and can be made with any flavor you like. I just made some for a party we had and they were a huge hit. So many people asked for the recipe. Enjoy! Is it possible to use pomona pectin? If not, what brand do you use? I’ve never tried pomona pectin. I usually use Sure-Jell pectin. It makes the clearest gumdrops.